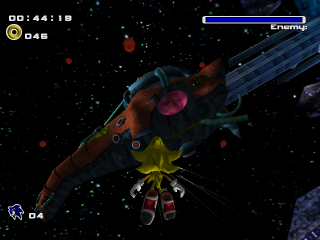 Finalhazard is the last boss of Sonic Adventure 2, formed when Biolizard fuses itself to the outside of the Space Colony ARK. Super Sonic and Super Shadow fly into space to defeat it as the ARK plummets towards the planet. After the battle, Shadow appears to die as he reverts back to his normal self and catches fire in the atmosphere. In Shadow the Hedgehog, however, it is revealed that he was found and restored to health by Eggman. Finalhazard is a pretty simple boss. 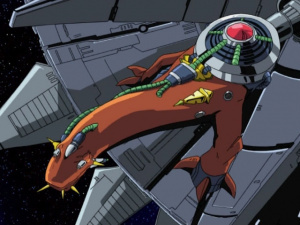 Due to its damaged life support system, it attaches itself to the Eclipse Cannon for power. Though severely weakened it is still a powerful monster. His weakness is the boil looking things that will appear on his body. You must hit the swellings to damage him. 1st Hit: During the first part, He basically does nothing until you get close. Once you do, He surrounds himself with the 9 egg(3 in a row) It's pretty simple to maneuver around this and hit him. 2nd Hit: He starts shooting 2 laser beams from out of nowhere on his body. Maneuver past these, if you get hit by one, you will not be able to move for about 5 seconds. 4th Hit He will surround himself with his eggs and shoot lasers. Be careful the eggs do slow you down as well. 5th Hit Same as the the 4th, But this time he is faster and a little more erratic with his egg shooting. It should be noted throughout the battle that all the people who talk to Sonic and Shadow mention there is only 4 minutes until impact with Earth. The background becomes more red as you play, but you have unlimited time as long as you have rings.